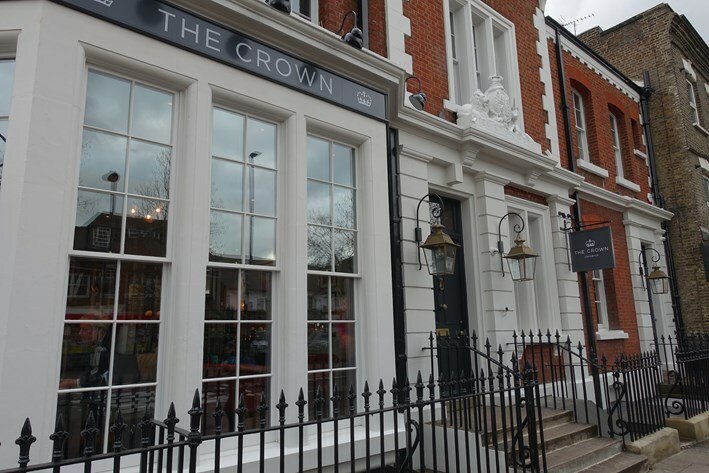 The Crown in Chiswick is in the premises of what used to be Carvosso, once the site of the police station in the Chiswick High Road, which originally opened in 1872 and featured stables for the police horses; this lasted a century before being relocated in April 1972. The Crown is the fourth London pub to be given a makeover by Henry Harris, who made his reputation cooking at Racine in Knightsbridge. The others in the group are The Hero of Maida, The Coach in Clerkenwell and Three Cranes in The City. The pub would have had the more interesting name The Harlot, a reference to the Harlot’s Progress series of paintings by Chiswick artist Hogarth, until the name was dumbed down to The Crown after the mistake was made of testing the name on a local focus group. It is worth noting that perhaps the most famous advert in history, the Apple "1984" advert that aired at the Superbowl, had the a record-breakingly terrible focus group score, and was almost pulled. Sometimes you just have to go with what your instincts tell you. The head chef here is Daniele Zaffora, originally from Sicily, who used to work with Henry Harris as sous chef at Racine and who more recently worked at the Dover Arts Club. The menu was a mix of old school brasserie classics like fish soup and some slightly more exotic dishes. Henry Harris himself was in evidence in the kitchen tonight. The wine list had 63 references, ranging in price from £19.75 to £97, with a median price of £42 and an average mark-up of 2.7 times retail price, which is quite fair by London standards. Examples were Villa Montes Sauvignon Blanc 2018 at £24.50 for a bottle that you can find in the high street for £10, Johannesholf Reinisch Pinot Noir 2017at £46.50 compared to its retail price of £13, and the very enjoyable Viña Tondonia Tinto Reserva R. López de Heredia 2005 at £70 for a label that will set you back £35 in a shop. Corkage was a fairly priced £20. The main dining area was a narrow L-shaped room, with lots of paintings along one wall and the other side of the room facing into the courtyard. There is an additional private dining room, and around 90 customers can be seated at any one time. Tables were quite tightly spaced but decently sized, with a lot of hard surfaces. The latter contributed to quite high noise levels, peaking at 96 dB on my meter. 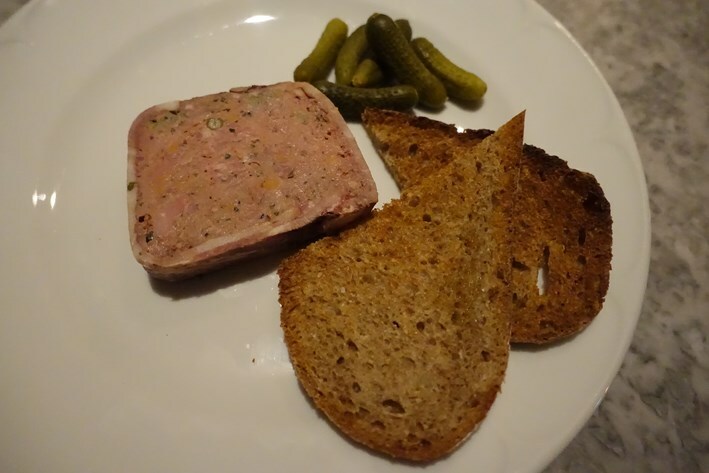 A chicken liver parfait was quite rustic, coarse in texture but with plenty of liver flavour, served with toast and cornichons (13/20). 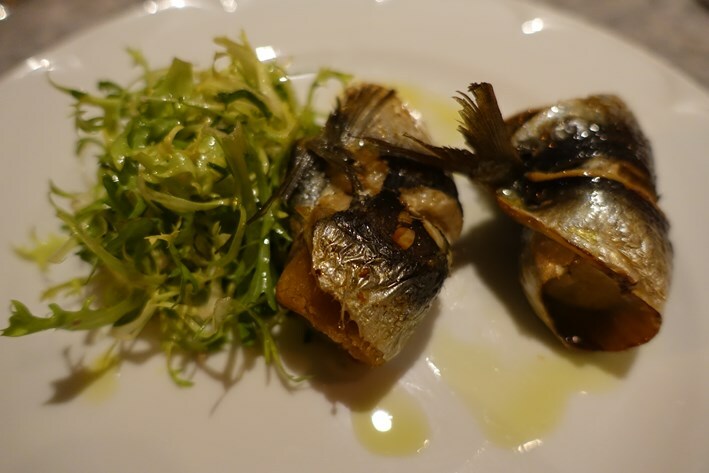 The least good dish was sardines rolled up and stuffed with a butter brioche filling, which didn’t really work for me (11/20). 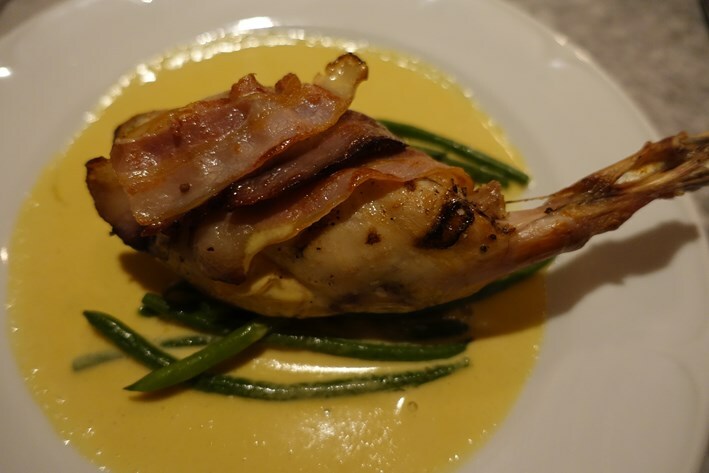 Rabbit leg was wrapped in bacon and came with green beans and mustard sauce. Rabbit can easily dry out but not here, and the gentle heat of the mustard sauce was a classic pairing for the rabbit (easily 13/20). Culurgiones are pleated pasta parcels stuffed with potato and Pecorino, a dish originating in Ogliastra in Sardinia. Here the pasta was indeed stuffed with confit potato and Pecorino cheese, resting in an onion squash guazzetto (rich sauce). The pasta was properly made, though the overall effect of the pasta, potato and sauce was quite rich, and perhaps some additional dish element to bring balance might have been useful (12/20). Chips were presumably bought-in but were properly crisp. Desserts were impressive. 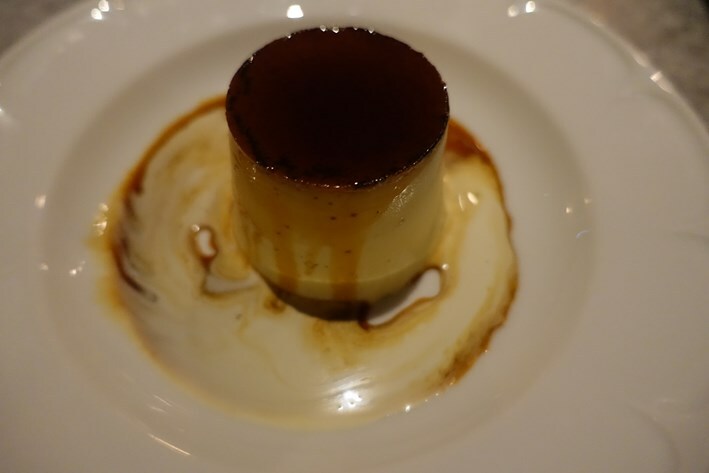 A crème caramel had excellent texture (15/20) and a chocolate cremeux had pleasingly creamy texture and was complemented by a good rhubarb sorbet, whose sharpness nicely cut through the richness of the chocolate. 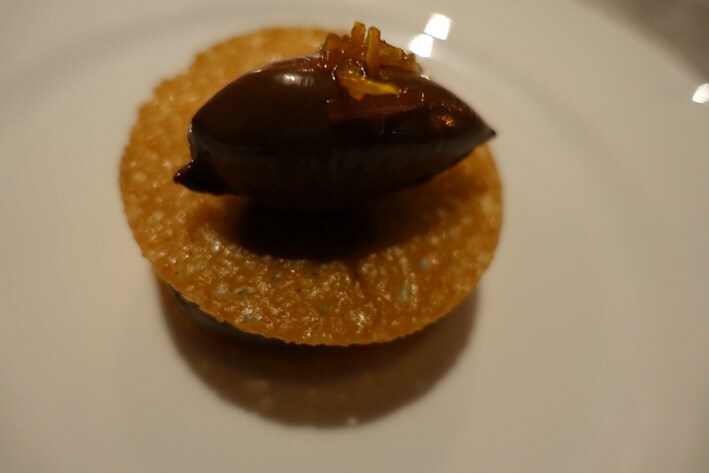 The tuile that separated these elements was not quite as crisp and delicate as it might have been, but the dish was otherwise good (14/20). 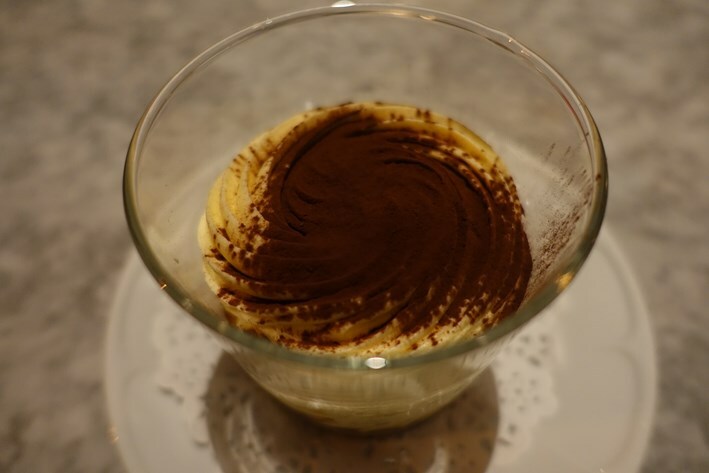 Best was a lovely Armagnac tiramisu, with deep coffee flavour and excellent texture (easily 15/20). Coffee was Illy and was fine. Service was friendly, led by a manageress who used to work at The Coach and before that at Dock Kitchen. When dishes arrived it was a case of “who ordered what?”, but after all this is a pub rather than a formal restaurant. The bill came to £56 a head for three courses and coffee, as well as wine (via corkage). If you shared a modest bottle from the list then a typical cost per head would be around £55 or so. The Crown was doing very well even on its fourth night, a soggy and cold winter Tuesday: people without reservations were being turned away at the door. The Crown is definitely an improvement on its predecessor on this site, and was already operating effectively just a few days after it opened. This is a very well located site and it will doubtless prosper. I am honestly surprised by some of the favourable reviews of The Crown. I have been twice now and on both occassions have been massively disappointed with food, service and general layout. The owner and management team clearly know who the food critics are and spend most of the time schmoozing them rather than actually chatting with the average customer. The steak tartare I had as a starter resembled what can only be described as a cow pat and they served incredibly burnt toast to accompany the steak tartare, the main course was also sloppily served and the service was so so. If only I was a food critic or an important instagrammer....Wish I could attach photos of the food I was served.